I have seen this before. This is from 30 year old memories. Check your oil pressure switch. If it has a complete circuit with the engine off, then pull the switch and recheck it. If it checks good, then install a manual oil pressure gauge. Turn the engine over until the oil pressure comes up. then watch the oil pressure. If it stays up, or is very slow to bleed off, then you have found your problem. The cause is an oil galley plug in the back of the engine that is installed too far, partially blocking the oil passage that feeds the switch. 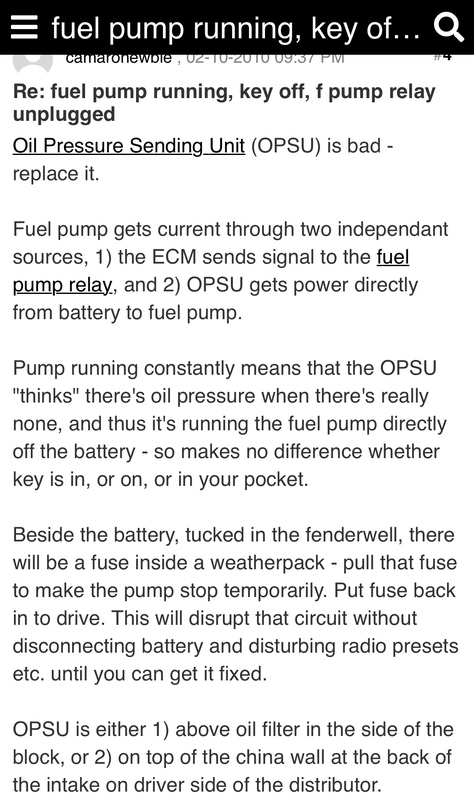 @Hoosier Rick and @dime-dozen , I saw your replies and was curious myself since I never heard of the oil pressure switch having it’s own independent power supply to the fuel pump. I always thought the oil pressure switch was only a shut off safety for the pump. I found this online, lol something new I’ve learned and have had GM vehicles for the past 35 years! Concur with the others. The problem is either the relay has failed closed, or the oil pressure switch has failed closed. GM wired the fuel pump relay in parallel with an oil pressure switch. On the '87? I pulled a harness from back in 1995 when I converted my truck to TBI, there was a T fitting coming off of the oil filter adapter that had the oil pressure gauge sending unit (1 wire, bell-shaped), and a 2 pin oil pressure switch. The 2 pin switch is the one in parallel with the relay. If you unplug that switch and the pump stops, that's the issue. If that doesn't help, unplug the relay. If it's still running then you have a short, most likely at either the oil pressure switch or relay. I don't know exactly why GM ran the oil pressure switch in parallel with the relay, unless they just didn't trust the relay. The oil pressure switch is not needed at all -- the truck will start and run fine without it. There is a persistent rumor that it's a safety feature, and that if the engine loses oil pressure that it will shut down the fuel pump. That is not how it's wired. It really is just a redundancy for the relay. I hope you replaced the oil pressure switch. Whenever I get into these "fuel pump relay" discussions, I always point out that it's an important safety item. The fuel pump must stop when the engine stops turning. I have a friend who drove an old beater car with a jumper installed where the fuel pump relay was supposed to be. He got in an accident and was knocked unconscious by the impact. The pump continued to run even after the engine stopped because the impact had broken the fuel line to the engine. It pumped a nearly full fuel tank onto the exhaust. He was pretty crispy when the paramedics got him out, and he spent almost a year in the hospital after that. You don't want to go through that or put your family through that. This happened to my 91 back in like 95. My gauge wasn’t working either. I replaced the pressure switch and the relay. Not sure which one was the problem, but that solved it. Gauge went to working too...seems odd cause that should have no effect. My thought is though it was the pressure switch.